Starting while the cat is a kitten they should have their teeth brushed. Kittens begin to get their baby or temporary teeth at about 2-3 weeks of age. Their permanent teeth usually begin to come in at about 3 - 4 months of age, and all of their adult teeth should be in by about 8 months of age. Brushing a cat's teeth is not as hard as one might think and just like trimming a cat's claws, it is something both the owner and the cat can become accustomed to with a little practice. 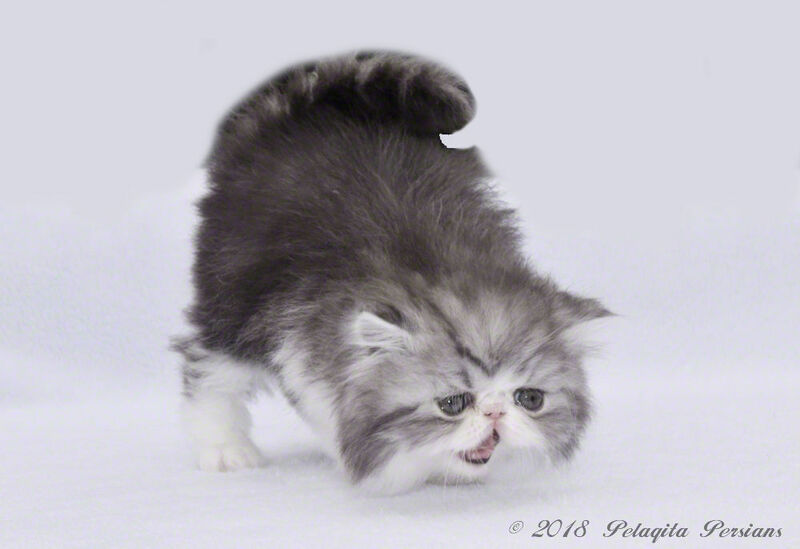 In this article, we will be addressing brushing a cat's teeth and there are other articles on coat maintenance, eye cleaning, nail trimming, teeth brushing, ear cleaning, and bathing. This kit has everything you need in it. Click on the picture and you can order this great dental kit directly from Amazon.com. You may also use a soft-bristled tooth brush similar to a human baby toothbrush. However, the cat toothbrush has a slightly angled head that allows for better entry into the cat's mouth. A bristled tooth brush is better for reaching below the gum line – an important area to brush. The first step is to start with a clean, healthy mouth, such as with a young pet with healthy new teeth and gums or after the cat has had a professional dental cleaning. Periodontal disease usually affects the upper, back teeth more commonly and more severely. Plaque builds up on the tooth surface, especially just under the gum line. It takes less than 36 hours for this plaque to become mineralized and harden into "tartar" (calculus) that cannot easily be removed with a brush, therefore daily brushing is recommended to remove the plaque from under the gum line. Pick a time of day that will become a convenient part of your daily routine. Place your cat on a counter or table. Start by offering the cat a taste of the veterinary toothpaste on the tip of your finger. Next, let the cat taste the toothpaste, then run your finger along the gums of the upper teeth. 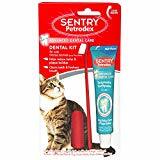 Once you have massaged the teeth with your finger and accustomed your cat to the taste of the veterinary toothpaste that is enough for the first training session. Finish by praising your cat and giving it a favorite treat. Once the cat accepts the tooth "brushing" with just your finger, the next step is to introduce the toothpaste on the finger toothbrush. Get the bristles of the brush along the gum line of the upper back teeth and angle slightly up, so the bristles get under the gum line. Work from back to front, making small circles along the gum lines. It should take you less than 30 seconds to brush your pet's teeth. Do not try to brush the entire mouth at first. If all that your pet lets you brush is the outside of the upper teeth, you are still addressing the most important area of periodontal disease – prevention. If your cat eventually allows you to brush most of her teeth, so much the better. It may take several days for your cat to become used to having its teeth brushed. Follow the procedure with praise and a treat after each session. Even with the best tooth brushing, some cats may still need an occasional professional dental cleaning by the veterinarian. By brushing your cat's teeth daily and curtailing the amount of periodontal disease, you may reduce the frequency and involvement of dental cleanings and provide your cat with a healthier, sweeter smile. Never use human toothpaste as it may foam, cause stomach upset or make them vomit.